The Poorvu Center is piloting Gradescope for the Spring 2019 and Fall 2019 terms. To learn more about the pilot, please see the following page our Poorvu Center website. To enabled Gradescope for your class, go to Settings → Navigation → and drag Gradescope above the fold. 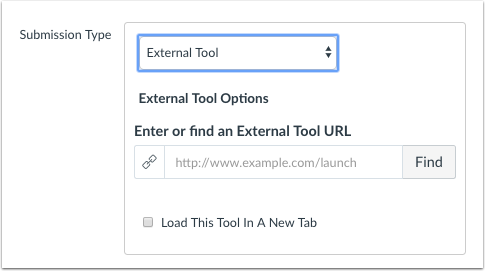 Scroll to the bottom of this page and save the changes to enabled the tool for your class. 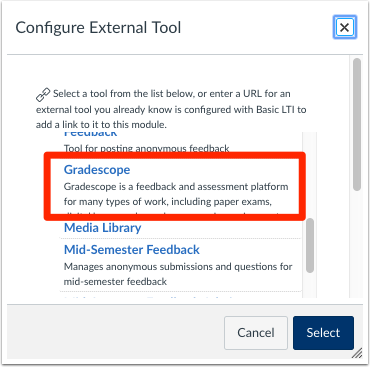 The first time you click on Gradescope from Canvas, it will open a new window, and ask if you want to create a new course, or link to an existing one. You should not need to sign in again. 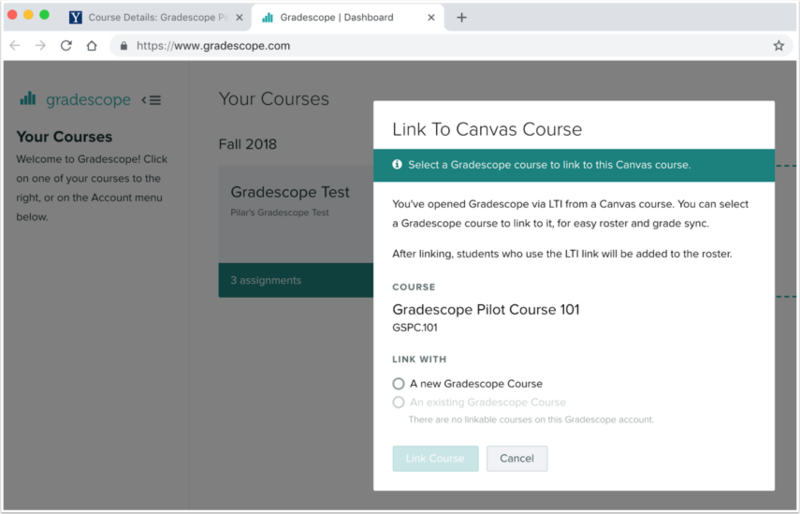 Only those with the role of Instructor, Guest Instructor, or Teacher (not commonly used) can create and link to a Gradescope Course, and create and link assignments. TAs or Teaching Fellows will be able to grade assignments already created. If you choose to create a new course, ensure the term is accurate in Course Settings before continuing. 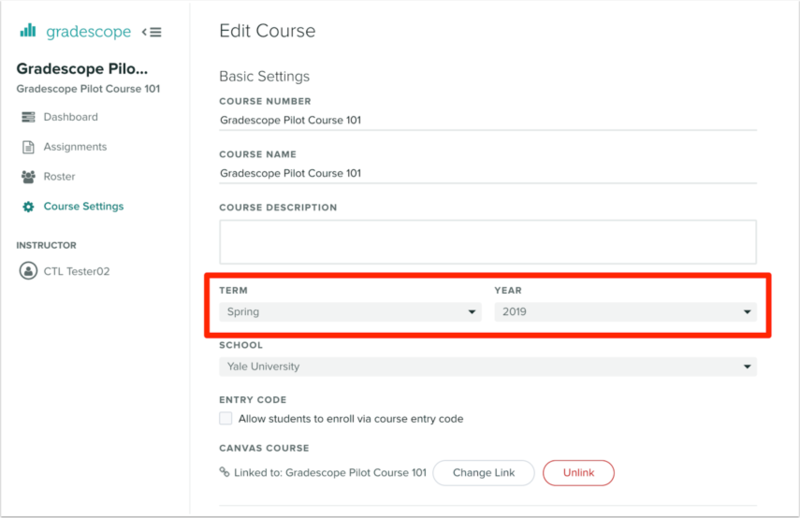 If you are creating a Gradescope course for a spring class but it is still during the fall term, Fall 2018 will be the default, instead of Spring 2019. Optionally uncheck “Let users know that they were added to the course” before you Sync to avoid unnecessary emails to your class. 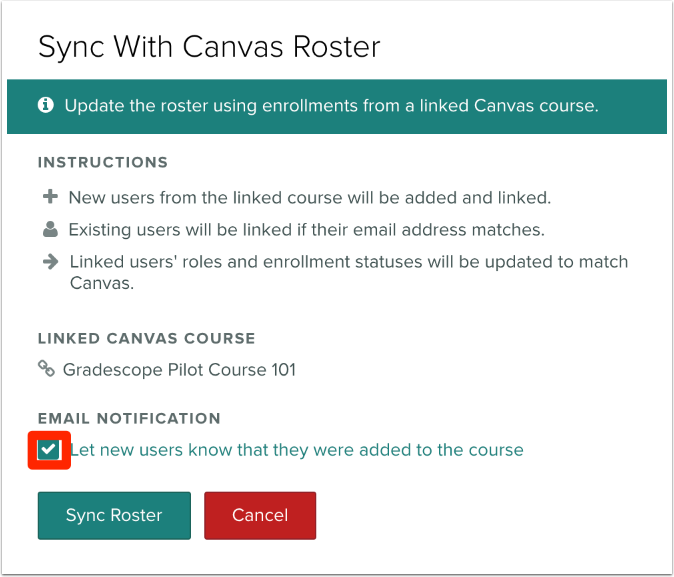 Once your roster is synced, users who were added from Canvas will have a chain link in the “Linked” column with their roles associated with them. First, create an assignment in Canvas where the Submission Type is External Tool. (For information on how to create an assignment, see the following guide.) 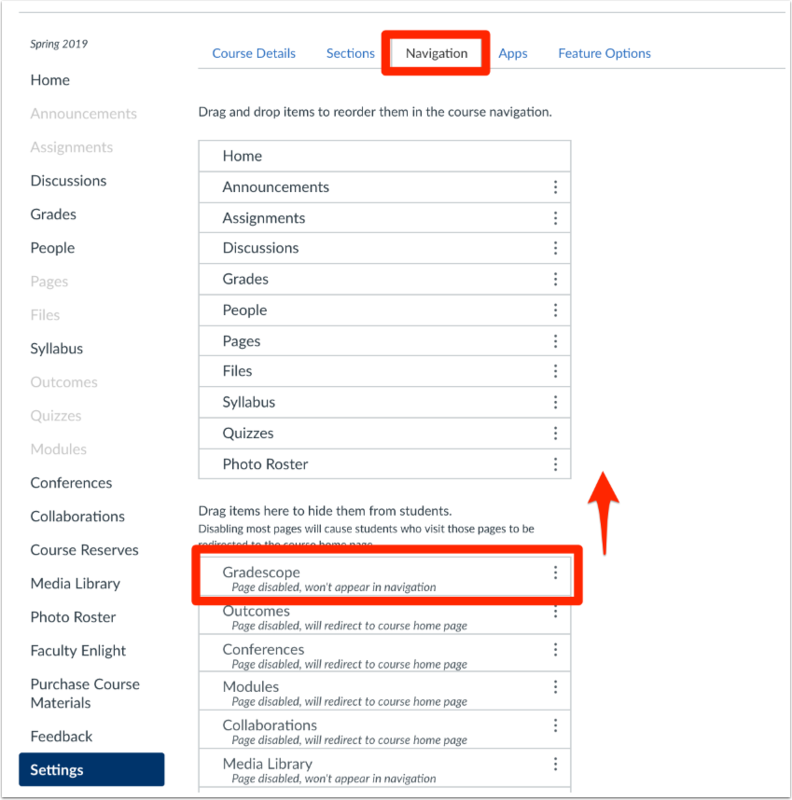 This will create the assignment for your students in Canvas that will serve as a passthrough to Gradescope, regardless of Instructor or Student submitted assignment, and will create the appropriate column in the Gradebook where grades will be sent. Complete the other Assignment settings as desired, and create and publish your assignment. The assignment must be published for Gradescope to find it to link to. 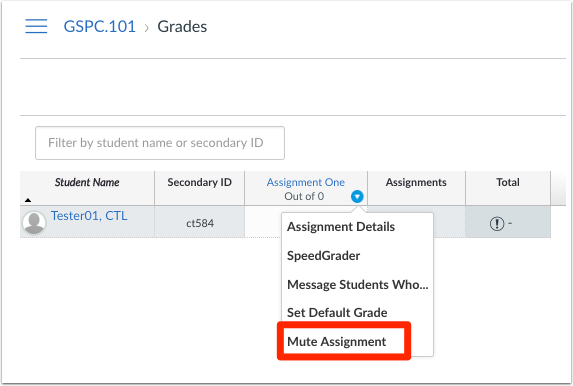 If you want to prevent students from seeing or getting notified about the grades in Canvas for a particular assignment, mute the assignment in the Canvas Grades tool until you are ready to release grades. After the assignment is created in Canvas, go into Gradescope to create your assignment. See Gradescope's “Get Started” guide on how to create different types of assignments. 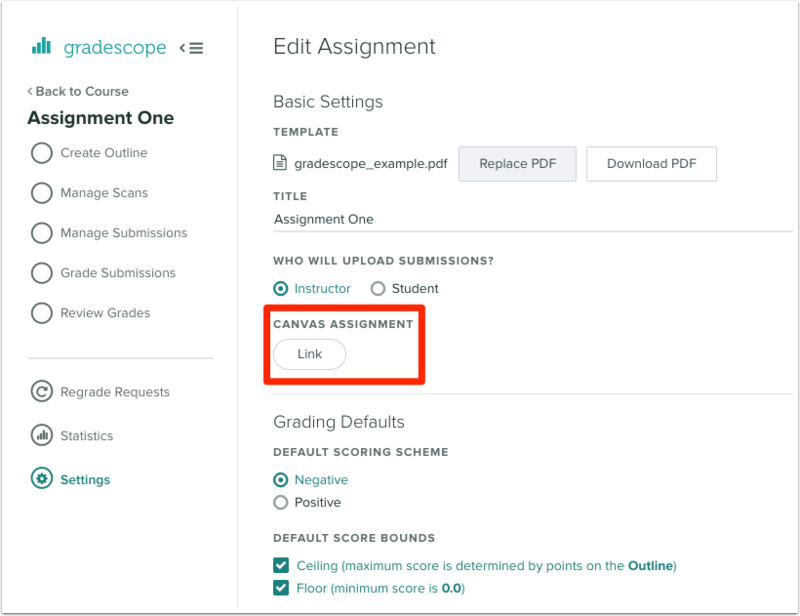 Once your Gradescope assignment is created, link it to the appropriate Canvas assignment by going to the “Settings” of the Assignment, and choose the Link button under Canvas Assignment. The integration will populate with the list of assignments you have already created in Canvas. Choose the appropriate assignment, and choose Link Assignment. Save your changes. You assignments are now linked. 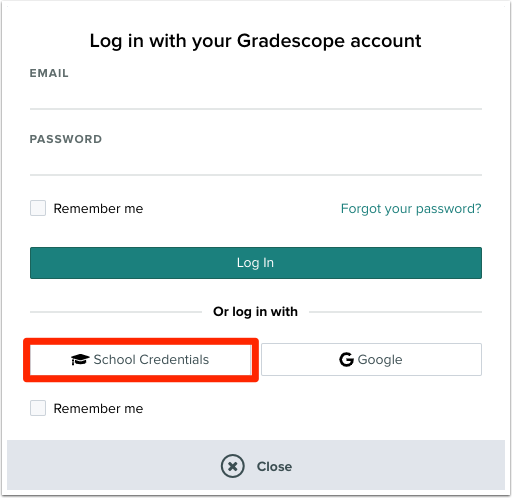 When you have finished grading in Gradescope, you will be given the option at the end to publish grades back to Canvas, updating the Gradebook with the scores from Gradescope. Please login with your NetID and Password to continue. 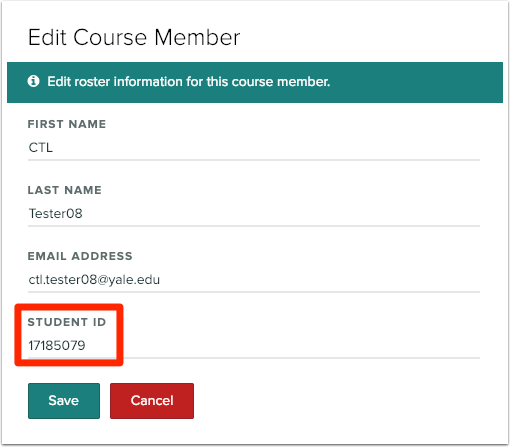 When batch uploading student files into Gradescope, you can have your students identify themselves by both their Name (First Last) and Student ID, which in Gradescope is mapped to the Yale UPI. In Canvas, the SIS ID is the Yale UPI. In Gradescope, this is the Student ID, visible if you edit the student in the Roster. To see the Student ID, first hover over the name until the “Edit” icon appears. Click Edit, and you will see Student ID. 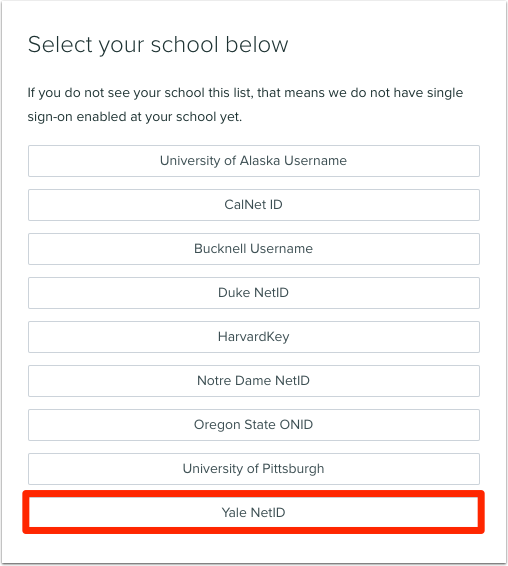 Students can look up their UPI in Yale Directory, and it is printed on their ID cards as well.